If your doing a significant amount of .NET development you have either used Lutz Roeder's Reflector or wished you were using a tool better than ILDASM. As many people have already commented this tool is one that is critical to .NET API investigation. 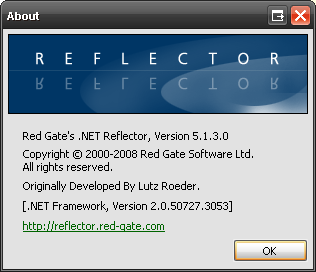 I was kind of shocked when I went to use Reflector today (after updating) and I saw Red Gate Software literally written all over it. 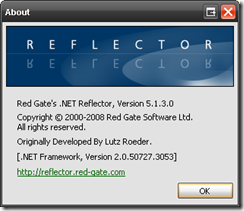 It appears that Red Gate has taken over ownership and development of Reflector. I am not sure that I fully understand this move by Red Gate, given that Reflector is an extremely mature product and the innovation is now being pushed by a stable plugin architecture. I guess as long as it remains free I cannot complain to much.